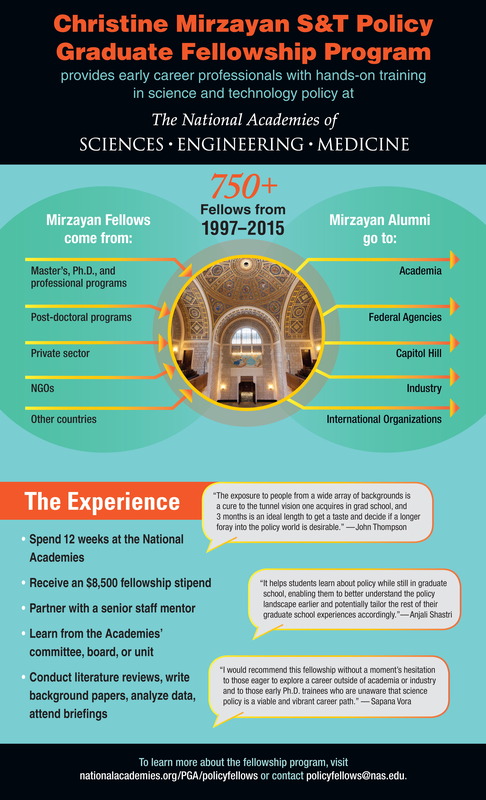 Christine Mirzayan was a Fellow in the second year of the Policy Fellowship Program and was assigned to the Center for Education. She had recently finished her PhD from the University of California in San Francisco and had been selected as a 1998 American Association for the Advancement of Science (AAAS) Congressional fellow. At UCSF, her research focused on the development of the vertebrate nervous system. In particular, she analyzed the molecular mechanism by which diffusible cues guide the migration of developing axons. While at UCSF, she found that although she enjoyed basic research, she was increasingly interested in the role that science plays in society and looked forward to a career that would allow her to utilize her scientific knowledge to address the political and social problems facing our nation. Tragically, she was unable to reach that goal when she lost her life during the last week of the fellowship program. The National Academy of Sciences has named the program in her honor. The National Academy of Sciences has established the Christine Mirzayan Memorial Fund to celebrate Christine's love of life, enthusiasm for science, intelligence and high aspirations for contributing to human welfare. Get more information about this fund and how you can make a donation.